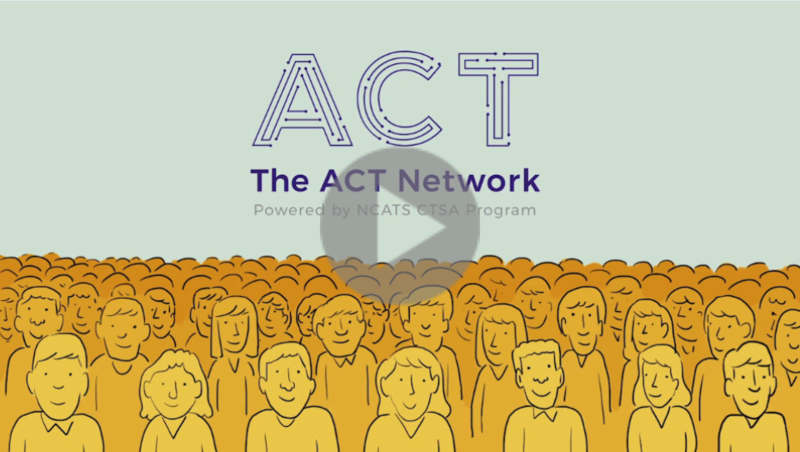 Welcome to the ACT Network! The ACT Network is a real-time platform allowing researchers to explore and validate feasibility for clinical studies across the NCATS Clinical and Translational Science Award (CTSA) consortium, from their desktops. ACT helps researchers design and complete clinical studies, and is secure, HIPAA-compliant and IRB-approved. ACT was developed collaboratively by members of NCATS’ Clinical and Translational Science Award (CTSA) consortium, with funding from the NIH National Center for Advancing Translational Sciences. Learn about your patient population in depth and in real time, from your desktop. Iteratively test and refine inclusion and exclusion criteria to confirm the feasibility of your clinical study. Search for patient cohorts across the CTSA network to identify potential partners for multi-site studies. Access easy-to-download results for use in funding proposals and IRB submissions to demonstrate the feasibility of your clinical study. Learn more about how ACT benefits clinical investigators, the CTSA consortium, and patients. Is ACT Right For You? This short quiz will help you understand how ACT can benefit your work. Access tutorials to learn the nuts and bolts of using ACT. Review answers to commonly asked questions about ACT. Learn more about the sites and data available through ACT. Use this interactive tool to discover how ACT can help you accomplish your 'jobs to be done' as a clinical investigator. Find out more about how ACT is governed, how it works with local IRBs, and how to cite ACT in your work.